The poem was written in early 1963 and first published in The Irish Times. It portrays an instinctively timid person poised to make a stand against the nature he was born with. The defeated child of ‘Death of a Naturalist’ (and the over-imaginitive youngster of ‘The Barn’ will grow in courage and see himnself a little more clearly. The poem’s title is borrowed from English philosopher Francis Bacon’s book The Proficience and Advancement of Learning (1605). Heaney prefers the indefinite article to specify an incident instrumental in his own personal development. The speaker sets out along the river. His aside confirms the habitual choice of route (As always, deferring/ The bridge). As he stands Hunched over the railing, his initial focus rests on the folds and sheen of water (pliable, oil-skinned) and the reflections cast upon it (wearing/ A transfer of gables and sky). He spends a moment watching ship-shaped swans whose dipping for food reveals their darker under-body (dirty-keeled). His attention is overtaken by squeaking sounds expressed via a stream of sibilants and velar plosives: Something slobbered curtly, close/ Smudging the silence. The poet’s use of synaesthesia interweaves vocabulary of sound and vision to magnify the repulsiveness he is experiencing. His first reaction is a gag of nausea (My throat sickened as a first rat slimed out of the water), then acute anxiety (cold sweat) followed by an oath of disgust (God) at the sight of a second scuttling rat nimbling to outflank him. Given his innate sense of fear (dreaded), Heaney’s soldier-like resolve to create a strong position on enemy territory comes as a surprise to him: Incredibly then/ I established a ( ) bridgehead. Indeed increasing self-assurance brings a surge of excitement (I turned to stare/ With deliberate thrilled care) and the will to face his hitherto snubbed rodent eyeball to eyeball. 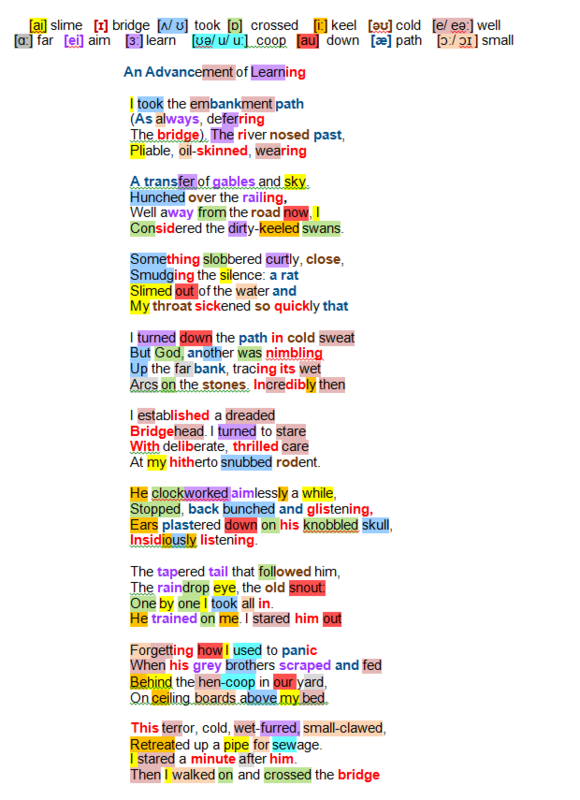 The description that follows is an example of Heaney’s talent for matching language and observation. He depicts the rat’s haphazard movement (he clockworked aimlessly a while), its concentration and its greasy anatomy (back-bunched and listening/ Ears plastered down on his knobbled skull), its cunning guile (Insidiously listening). Finally the trial of strength: He trained on me (the metaphorical ‘rifle’ extends the military imagery of bridgehead) the who-will-give-way-first I stared him out. Victory! The agent of so much irrational fear around the childhood farm (This terror, cold, wet-furred, small-clawed) climbs down, retreating to where it belongs: up a pipe for sewage. A momentary glare of triumph, and the speaker walks on; he has successfully crossed the psychological and emotional ‘bridge’ he avoided in the first couplet. The idiom ‘I’ll cross that bridge when I come to it’ (in the sense of ‘face up to a problem when it crops up’) is appropriate to the poem’s message. neologism: clockworked – the tin-plate toys of Heaney’s childhood were wound up; when released they whirred round in random circles!